THE Department of Health (DOH) does not see the need to enlarge the graphic health warning (GHW) in cigarette packs to more than the current 50 percent of the packaging. Health Secretary Paulyn Ubial said in a press briefing Friday that the DOH is moving towards plain packaging, rather than increasing the size of the health warning. 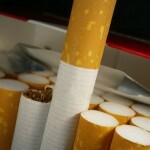 Ubial noted that the graphic health warnings in other countries are as large as 90 percent of the entire packaging. “It has been proven in other countries that plain packaging… It is actually more effective than increasing GHW,” she said. The brand and product names, meanwhile, are displayed but in a standard color and font style coupled with graphic health warnings. Last Friday, the full implementation of the GHW Law started with all tobacco products in the country now required to bear graphic health warnings, which show the ill effects of smoking to people, in its packaging. Meanwhile, the New Vois Association of the Philippines (NVAP) is pushing for other innovative measures that will amplify the effect of the GHWs in cigarette packs. Foremost in their plan, according to NVAP President Emer Rojas, is to warn those buying cigarettes per stick by putting up graphic health posters in sari-sari stores and requiring street vendors to place GHW stickers in the boxes used in selling cigarettes to motorists.